You gave us five memorable incidents from 2014, so we'd like to ask you to talk about them in order. 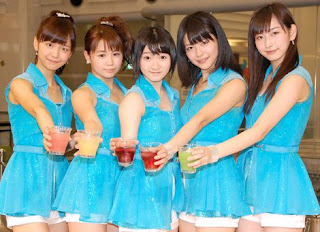 Firstly, on the 24th and 25th of May, Juice=Juice held your first bus tour. Miyazaki: We've always wanted to hold a bus tour, so our dream had come true at last. Though I'd been on a Satoyama bus bus tour before, as part of the unit Green Fields. It was a lot of fun since we got to talk a lot and get closer to the fans, whom we'd normally only talk with at events like handshakes. We call everyone who's been involved with Juice=Juice as part of the 'Juice=Juice Family', and we members thought of it more like a family excursion rather than a bus tour. It was also before we went on our live tour, where we got to perform our senpai's songs for the first time at the bus tour. Is it any different from remembering a new Juice=Juice song? Miyazaki: For new songs, the sensei would teach us how it's done. I hadn't danced up until I entered Hello! Project, so I would remember by watching. But honestly, I had no idea about how to move. At the time, I could only remember the general flow of the dance, so the members would help me out with the detailed parts. How did the fans respond when you performed covers of your senpais? Miyazaki: It seems that they thought that we'd only be performing Juice=Juice songs, so every time a song would end, they give us huge cheers of 'Ohhh!' It was so pumped up, I don't think I've ever seen people so excited before. Is there anything that left an impression besides the live performances? Miyazaki: We also saw them off with a 'good night', dressed in pyjamas, but since it was immediately after our live performance, we were all sweating (laughs). Continuing on, your live tour started from the 13th of June. Miyazaki: In 2013, we toured around together with Berryz Kobo-san in a 'Naruchika' tour, but that was a completely different thing compared to this tour on our own. It made me really happy that everyone at the venue was there to see only Juice=Juice. How were the lessons building up to the opening day? Miyazaki: The rehearsals were really tough... Livehouses don't have any air conditioning, so in order to imagine that, we cut off the cooling at the rehearsal stage, and we would do more than three performances in a day under those conditions. It was quite tough, so I was extremely worried if we'd be fine at the live tour itself. But when the real thing came along, I noticed that the others were helping me, it didn't feel difficult at all, it was fun. Since we'd built that up at the rehearsals as well. You're still in the middle of your tour, but has there been any place that was particularly memorable? Miyazaki: I'm from Ishikawa prefecture, so it makes me happy that we were able to go to my hometown. It was our first concert in my hometown, so my friends came to watch it as well, and they cried when they saw me dancing. I didn't want to get affected and end up crying as well, so I didn't look at them (laughs). Those friends came to Takayama as well, wearing my T-shirt and brandishing pink glowsticks. Did it not feel embarrassing to perform in front of your friends? Miyazaki: I wasn't embarrassed, but I felt this strange sense of nervousness. My family came as well, and every time, my mother would come bearing gifts. When we were at Ishikawa, she brought some waffles that came recommended, and Ruby Romans, Ishikawa speciality grapes that are famous for being the largest in Japan, lots of things. I was worried whether anyone would eat it. She got so many that I had to tell her that all of us were thinking about maintaining our figures, so she shouldn't bring too many. And then, my mother thought that it was fine if they weren't eaten there and then. So the next time, she prepared them in takeaway sets, and passed them over to the rest in individual bags... I was happy, but I think my mother was a bit too into it (laughs). Isn't that a nice story!? Miyazaki: Also, the fans at my hometown mentioned how much they would like more H!P members to come to Ishikawa prefecture, so with the opening of the Shinkansen, I'd like to go to Hokuriku more. Including your tour, how have your concerts changed? Miyazaki: Even before we started with our tour, the staff told us that Juice=Juice were too textbook, so they didn't feel like concerts. It's true that we followed what had been set up to a T, so perhaps we had settled to much into that. Of course we couldn't mess it up completely, but thinking that we had to enjoy it with the audience, we started moving ahead more often. The third is the second anniversary of your major debut. How did your feelings change? Miyazaki: Juice=Juice's group name has an implication of 'freshness', but now that we're in our second year, we've got lots of kouhai. So we've all talked about how we need to accompany that freshness with our own abilities. We've got to learn more and more about singing and dancing. Is there anything that you're conscious about when it comes to singing? Miyazaki: Up to now, my voice would only project forwards, so our vocal teacher taught me that there are singing methods where the song is drawn in. That method of bringing out my voice was new to me, so I'm conscious about using that to allow me to sing better. Also, I'm listening to a wider range of music. 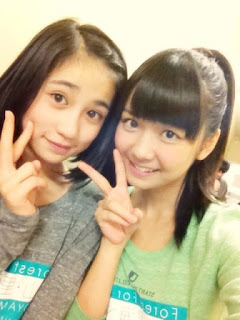 Kanazawa Tomoko-chan listens to Western music as well, so she gave me recommendations like Katy Perry-san. Though I generally can't understand what the lyrics are about (laughs). Just listening to them makes a difference, so I'll be listening to all sorts of artistes. With every new song, the level of dancing and singing goes up, doesn't it? Miyazaki: Whenever Tsunku♂-san comes out with a song, he'll message all the members, writing in to tell us that things were gradually going to get even more difficult, since that's his style. We realise that it shows just how much he's following our development, so we'd like to live up to his hopes. 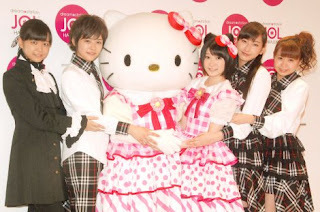 The fourth is that you performed in Engeki Joshibu's 'Musical Koi suru Hello Kitty' from November. Miyazaki: Kanazawa Tomoko-chan and I had basically no acting experience, so the fact that we would be acting surprised us. At the first script-reading and when the practices actually started, we were completely clueless, having no idea how to pass our words, or how to say our lines. Starting from the director, we were helped out by the staff. I played two roles, that of the God of the Land of Toys and of Sakaki-sensei. I used the dialect of my hometown Ishikawa prefecture in my role of the God of the Land of Toys, which made it easier to remember my lines. What did you gain from the stage-play? Miyazaki: The stage-play was one of Juice=Juice's first accomplishments. It took a long time, if you include the practice time as well, and we were always together, so when we got to the final day, I found it to be a wonderful accomplishment. If we get another chance to do a stage-play, I want to get better at acting. The fifth is 'H!P Countdown Live 2014'. Miyazaki: It was the first time that Juice=Juice weren't the youngest group. There was Country Girls-san, and Morning Musume。-san and ANGERME-san had new members, it felt pretty strange. It was heavily weighed towards former H!P Kenshuusei, so there must have been members that you already had quite a deep familiarity with. Miyazaki: Sasaki Rikako-chan has always amazed me from the time that she was a Kenshuusei, and even in ANGERME, she's at par with the senpai. Despite being a new member, Rikako shines gloriously. It's not just Rikako, new members are gradually joining H!P, so Juice=Juice don't want to be beat by them. Once a bit of time had passed since Juice=Juice had been established, we talked about what Juice=Juice would do if new groups were to pop up. But since new members have been joining gradually, we haven't had time to think about it deeply. But we have to do our best in order not to be beat. At this rate, the 'freshness' that we've had might be taken away. We definitely don't want to hand over that freshness, and while the fresh ones may be fresh, I believe that there are also different types of freshness. You mentioned freshness so many times that it's a mess (laughs). Is there a particular member that you've got your eyes on? You've really fallen for her, haven't you (laughs). What do you think about your relationship with the kouhai? Miyazaki: While we've now got lots of kouhai, we don't want to put on strange airs as a senpai, so we'd like to deal with them while still remaining fresh, with our spirits even hungrier. Please tell us your personal goal for 2015. Miyazaki: I'll turn 21 in April, so I'd like to become more mature. And I said that I'd work hard at cooking when I turned twenty, but I've only actually challenged myself just a little, so I'd like to continue on and put in more energy into cooking. What sort of dish would you like to try out? Miyazaki: Before, when I got a daikon radish, I checked it out online, and made daikon steak, wrapped in cheese. Besides that, I've only fixed up standard dishes like miso soup, so I'd like to make a Japanese dish that'll make people go 'Whoa!' when I post pictures on it on my blog, like it came from a store. Miyazaki: We're still in the middle of our live tour, and our goal is to go around all 47 prefectures, so we'd like to achieve that first. Then I'd like the Juice=Juice family that we met in all the venues in each location to gather up at one huge place, and build up a fun atmosphere at a concert. Also, so that we don't lose to the kouhai, I'd like to us improve our moods individually, and support one another while still seeing one another as good rivals within the group.